The California Legal Cold Steel Espada XL (AKA Espadita XL) is an ultra-limited, ultra-custom, ultra-compact-where-it-counts knife with a modified clip point blade courtesy of Andrew Demko. Knife critics are calling it, "the best thing since sliced bread" or in Cold Steel's case... "sliced pig." The Cali Legal Espada XL offers a blade measuring just under 4 inches, paired with a full-size handle for comfortable three-handed use. It just makes sense. 9.25" handle disappears in the pocket for convenient and discreet everyday carry. 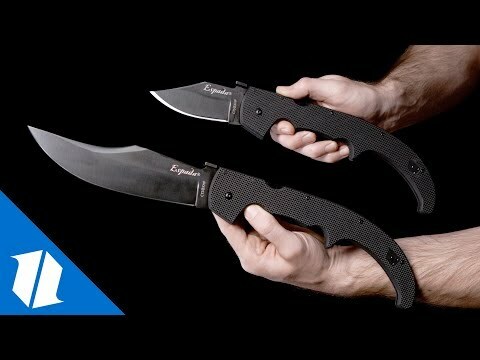 Unique blade/handle ratio for anyone who prefers a smaller blade but likes to keep all hands on deck. 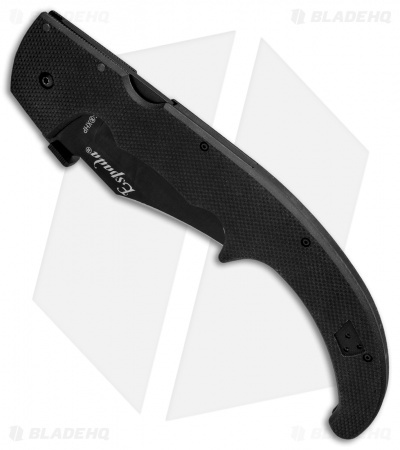 Abbreviated steel liners and Cold Steel's incomparable Tri-Ad Lock. Eugene B. needs help guys. Someone start a gofundme so this guy can take understanding a joke lessons. They even addressed your point at 1:29 into the video. Way to take time to research law and copy and paste all that without even watching a minute and a half into the video anyway. It's April Fool's, they knew Cali legal wasn't any part of this, it's just more into their joke. Way over your head though, guy. Got mine today in the mail and I love it! Thanks cold steel you really knocked this one out of the park. I'm not sure what is supposed to be "California Legal" about this knife. California's knife laws aren't all that strict. In terms of state law there's no length requirement on folders. "Folding knives are knives that “opens with one hand utilizing thumb pressure applied solely to the blade of the knife or a thumb stud attached to the blade, provided that the knife has a detent or other mechanism that provides resistance that must be overcome in opening the blade, or that biases the blade back toward its closed position” . All folding knives are legal. California Penal Code Section 17235. As long as they are in the folded position they can be carried in a concealed manner. 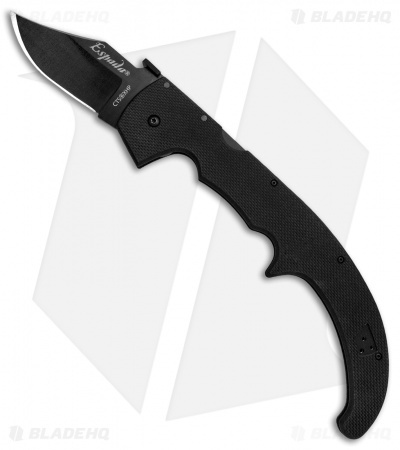 There is no blade length restriction per the penal code." 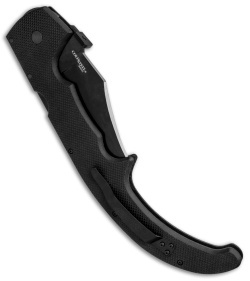 As far as I know there's only one county in the state with a length limit on a folder and that's LA county, and their length limit is 3" for blade length, meaning it wouldn't be legal to carry this knife there. "in the City of Los Angeles, it is illegal to publicly carry, in plain view, any knife, dirk or dagger having a blade 3"; or more in length, any ice pick or similar sharp tool, any straight-edge razor or any razor blade fitted to a handle. (There are certain exceptions, such as where the knife is for use in a “lawful occupation, for lawful recreational purposes, or as a recognized religious practice.”) The County of Los Angeles has a similar rule, which makes it illegal to openly carry, in public, “any knife having a blade of three inches or more in length; any spring-blade, switch-blade or snap-blade knife; any knife any blade of which is automatically released by a spring mechanism or other mechanical device; any ice pick or similar sharp stabbing tool; any straight-edge razor or any razor blade fitted to a handle.” In other words, it is illegal in Los Angeles County to openly carry any knife with a blade of 3"; or longer. It gets worse. Los Angeles Code section 55.01 also makes it illegal to carry any weapon concealed on one’s person. As such, in Los Angeles, you can’t openly carry a blade over 3", but you can’t carry such a weapon concealed, either." So it was designed to meet a requirement that doesn't exist, and fails to meet the only requirement that does? I'm sure the knife is well made and all, but marketing it as "California Legal" is deceptive, and could get someone in trouble if they take the claim at face value without doing their own research. Can't wait to get all three of my hands on this baby. I hope cold steel comes out with another with their exclusive San mai mai mai blade construction. Maybe a diamond core, clad in s110v, clad in elmax, clad in s35vn. Anyway, I'm getting two despite the fact that I'm in Ohio. You never know when you might end up in Cali. Typical Cold Steel quality, tough as nails, elegant and functional in its usual subtle kind of way. 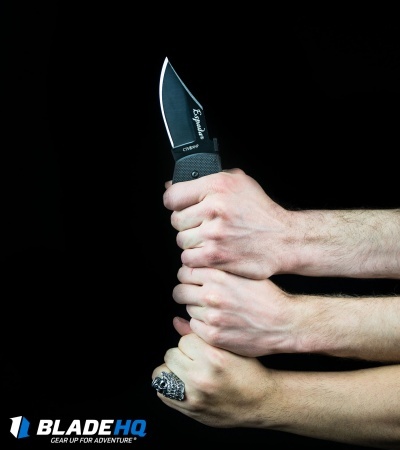 Allowed me, my dad and my brother to grip the knife to open a clamshell package from Best Buy, the extra torque that the long handle gave us allowed the three of us to truly apply simultaneous slicing power. Knocking off one star due to lacking cup holders, which would have come in handy when opening letters. Stay hydrated when using this tool, the added handle length means more strain to your tactile functionality and endurance. This is another winner from Demko and CS!! Blew it outa the park! now i can go safely anywhere in CA rockin this ! P.S. ironically CA doesn't have a blade length restriction unless u r on school grounds. This is the knife that I have been waiting for. I would give this 11 stars if it was an option. I wear size three xl gloves and have been looking for a knife with a larger handle, however I don't feel comfortable opening up a giant folder (you know with a blade that is 3 inches or longer) in public. The size combined with premium steel and the triad lock made this a must have!! After receiving the knife, I immediately ordered 5 more. Can't wait for them to arrive!! This is the last knife I will ever buy!!! Great rip on Cali knife laws. Happy April's Fools Day.